Download the software to your local system. This short document can show you the steps involved. If you are not comfortable with these instructions, please contact your local IT folks to help you. 1. Download the software to your local system. 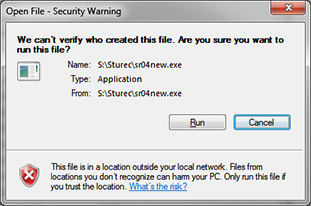 Before you even begin this first step, make sure you know where your STUREC© is located in your computer system! To find out, start STUREC© in the normal manner. With the Main Menu on the screen, press Alt-V to pop-up the enVironment information panel. It should look like this. 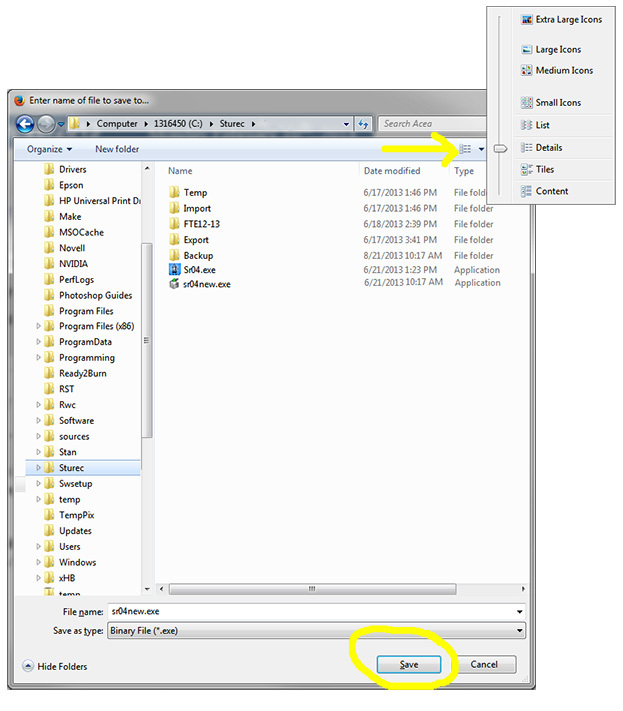 Make a note of the Default Directory then press <space> to close the pop-up. Close STUREC©. Now fire up your browser and point it to http://www.sturec.com Click on the Download button (just below the left end of the bridge). Fill in your LEA number (Local Educational Agency) and your real email address. Click the download button. If you see a new dialog with a request for a purchase order, please just fill in your name, we know who you are. You may see a reminder similar to this. Always Save the file, never request to Open this file. You will see a Save As... dialog box. 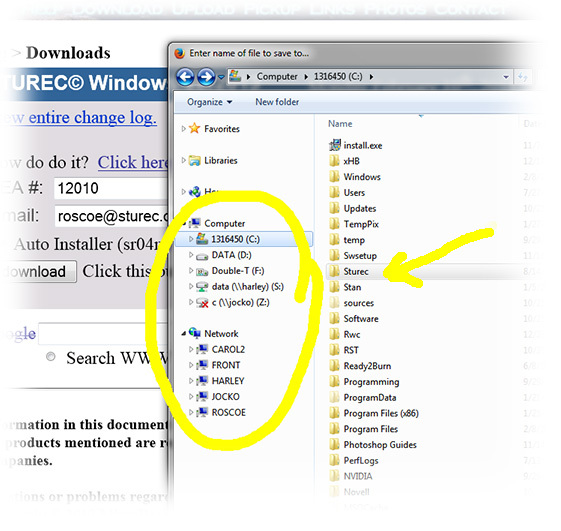 Remember where your installation of STUREC© is located. Find the correct drive and double-click it, then find the correct folder and double-click that too. If you can't see the date of the file, click on the thingie at the top and select Details from the list. Click on the Run button. If you are reminded that the file already exists, or are asked permission to Overwrite, always answer Yes. you want to save files. 2. Run the Installer to actually install the updated software onto your system. Ok, that's the first step. You may close your browser or just minimize it. Now for the second step. Find your My Computer somewhere on your desktop and double-click. and verify the appropriate date. It should be the date you downloaded it. It will always be right next to the Lighthouse icon. answer Yes for all of them. There are always 6 to 10 files. When finished, you will see the Extraction Complete message. 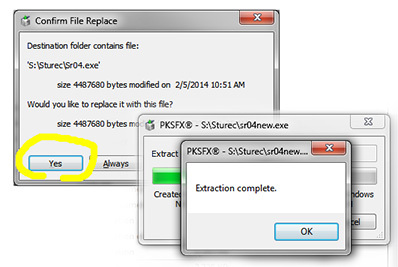 Click Ok and you are finished installing the update with the date shown on the Confirm File Replace dialog as above. You just downloaded and installed the STUREC© update. 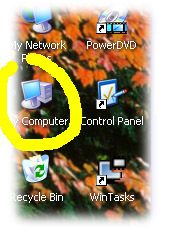 Just clean up your desktop then you can use your regular STUREC© icon to start up. STUREC© will recognize that you just did an update and will swing into the familiar Reindex screen. When that finishes you may read the notes and go back to work. 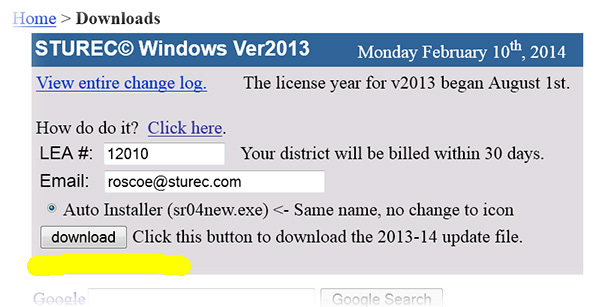 Remember, if you are on a network, everyone else must also close STUREC© only while you do the install and reindex. To make sure everything went as planned, you may want to press Alt-V again and double-check the Build Date.